When these little Topshop Eye Gleam* pots arrived for me to try, my first thought was ‘oooh, pretty!’. My second thought was one of concern that they might turn out to have the same sticky, pain-in-the-backside texture that ruined Topshop Glow highlighter. My third thought was ‘thank God for that’ when they turned out not to be blighted with that textural affliction! Topshop Eye Gleam pots come as part of their AW13 makeup collection The Damned. There are a few interesting bits and pieces in The Damned collection including some matte lip and nail products, but these creamy eyeshadow pots are definitely what caught my attention the most. The pots themselves are nice and sturdy, and feel weighty in the hand which is always good for products like these. The lids screw on nice and tightly which should help with preventing the cream from drying out too quickly. Speaking of the lids, I wish they were white with black dots like the usual Topshop packaging because I love that – although with The Damned being a pretty dark and vampy collection I do understand the departure. Now, texture – they are very pigmented as you can see above. They’re also super metallic, so if you’re not keen on a frosty finish that’s something to bear in mind. The black shade, Noir, also has a good smattering of glitter in there, definitely a party season shadow! 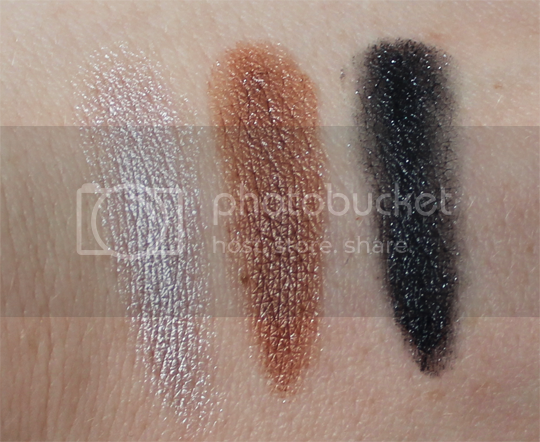 They are a lot smoother and creamier than the last cream shadows I blogged about (Bourjois 24 Hour pots), the texture is a little more reminiscent of Maybelline Colour Tattoos. If you have oily lids, I would recommend a good strong primer underneath Topshop Eye Gleam as the staying power of these couldn’t hold a candle to Maybelline or Bourjois’ offerings. You’ll also need a really thin layer to prevent creasing on oily lids, but this of course compromises the colour payoff you’re going to get. You could set with an eyeshadow, but to me that defeats the purpose of a cream eyeshadow as you’re just covering it up! All in all, these are fairly good – I would particularly recommend the Noir shade as it reminds me more than a little of Chanel’s Illusion D’Ombre in the shade Mirifique (just with slightly less glitter) and I can’t think of anything comparable in the same price bracket. The other two shades though, I could take or leave. There are versions on the high street a few pounds cheaper with similar colours and better staying power. 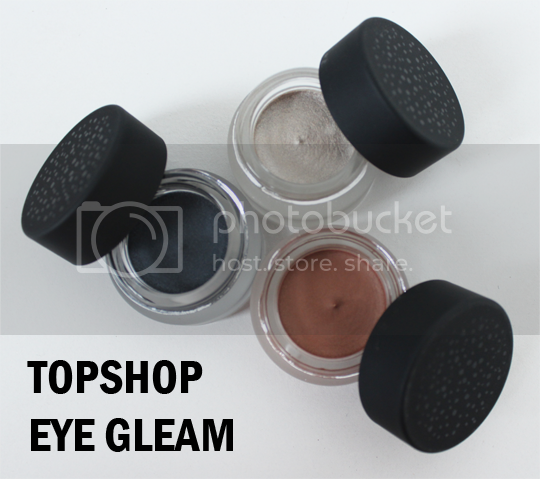 Topshop Eye Gleam is available now along with the rest of The Damned collection, and they cost £9 each. For £9 and that staying power I’d do with the Color Tattoos all the way, even though that black does look gorgeous!